Metal fibre burners from Infraglo - Sheffield. Metal Fibre has allowed us to move on to the next level in the manufacture and application of gas-fired infrared burners. By using metal fibre we can design and manufacture customised burners of almost unlimited diversity of size and shape, even burners that radiate internally. 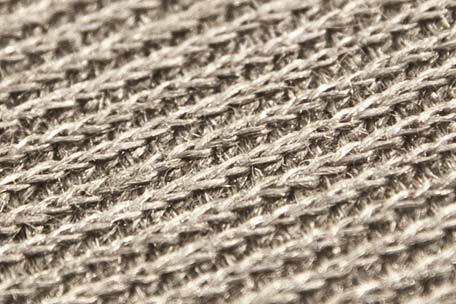 Metal fibre, the possibilities are endless! From a 10cm square burner heat output can vary from 1 to 20kW. Fecralloy* (metal fibre) is Fe-Cr-Al steel alloy containing "yttrium" and suitable for use over a wide range up to 1300°C. The yttrium is the key to its longer high temperature life, having greater oxidation resistance and form stability over other resistance alloys. *Fecralloy is the registered trademark of the UK Atomic Energy Authority (Now AEA Technology, Harwell). Our burners can be fired by high pressure gas or the latest premix systems, allowing accurate gas/air mixing and high turndown ratio, thereby ensuring the maximum fuel saving and minimum emissions. The robust nature of metal fibre makes it ideal for the most challenging of industrial applications and its low emissions mean it is as useable in the cleanest environments and in food applications. The high turndown ratio allows us to determine the radiating temperature of the burner, thereby effecting the wavelength of the energy emitted and ensuring that we can accurately tailor the performance of the burner to the material being heated.